Part I: The Crisis of the Critique of Knowledge. 1. Hegel's Critique of Kant:. Radicalization or Abolition of the Theory of Knowledge. 2. Marx's Metacritique of Hegel:. 3. The Idea of the Theory of Knowledge as Social Theory..
Part II: Positivism, Pragmatism, Historicism. 4. Comte and Mach: . The Intention of Early Positivism. 5. Peirce's Logic of Inquiry:. The Dilemma of a Scholastic Realism Restored by the Logic of Language. 6. The Self-Reflection of the Natural Sciences:. The Pragmatist Critique of Meaning. 7. Dilthey's Theory of Understanding Expression:. Ego Identity and Linguistic Communication. 8. The Self-Reflection of the Cultural Sciences:. The Historicist Critique of Meaning. Part III: Critique as the Unity of Knowledge and Interest. Retrospect on Kant and Fichte. Freud's Psychoanalytic Critique of Meaning. 11. The Scientistic Self-misunderstanding of Meta-psychology: . On the Logic of General Interpretation. 12. Psychoanalysis and Social Theory:. Nieqzsche's Reduction of Cognitive Interests. 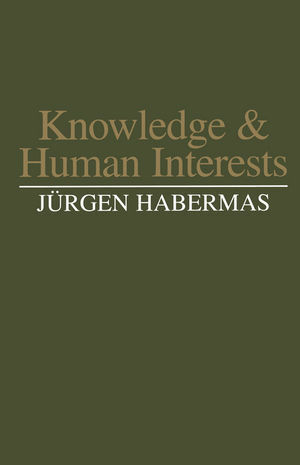 Knowledge and Human Interests: A General Perspective.